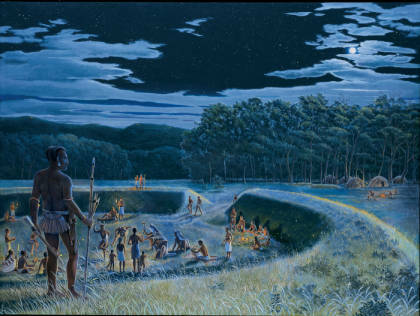 Painting from the Ancient Ohio art series depicting an Early Woodland/Adena (800 BC - AD 1) gathering at a ceremonial earthwork in the Hocking River Valley. It is important to emphasize that the Adena culture is not the name of any American Indian tribe. We do not know what these people might have called themselves, or how they defined their societal or cultural groups. "Adena culture" is a term of archaeological convenience that encompasses similarities in artifact style, architecture, and other cultural practices that distinguish the Adena culture from earlier and later cultures in the region. Since the Adena Mound site exemplified all the significant features of the culture, it became the “type site” and the name of the site was applied to the entire culture. Through research, we know the Adena people were hunter-gatherers, but also began domesticating various crops, such as squash, sunflower, sumpweed, goosefoot, knotweed, maygrass, and tobacco. These people lived in small villages near their gardens, but likely moved frequently as they followed animal herds and other food sources, such as nuts, which supplemented the harvest from their gardens. In addition to undertaking small-scale horticultural production, the Adena were also the first people to produce clay pottery in Ohio, which is characterized by large, thick-walled vessels that were likely used to cook ground seeds into an oatmeal-like substance. The Adena cemented their ties to particular regions by burying their dead in prominent mounds that archaeologists believe may have served as territorial markers. Sometimes the mounds were accompanied by small, circular earthen enclosures that may have surrounded ritual spaces. The Miamisburg Mound in Montgomery County, Ohio, is the largest example of an Adena burial mound in the state. Based on the archaeology conducted at the time, we know that Adena burial mounds contained multiple burials and these individuals were usually accompanied with funerary objects such as bracelets, ear spools, gorgets, or large ornaments worn around the neck, and bone or stone tools. Deceased individuals were either cremated or laid on their backs in timber-lined tombs. By around A.D. 1, some Adena groups began to build larger earthworks and to expand their efforts to acquire exotic raw materials, such as copper and mica. These later peoples are who we today refer to as the Hopewell culture, but many continued to follow the old ways in some regions, such as southwestern Ohio, and the Adena way of life persisted well into the first century A.D.
Abrams, Elliot M. and Ann Corinne Freter. Emergence Of Moundbuilders: Archaeology Of Tribal Societies In Southeastern Ohio. Athens, OH: Ohio University Press, 2005. Lepper, Bradley T. "The Adena Pipe: icon of ancient Ohio." Timeline Volume 27, Number 1, pages 2-15. 2010.